You agree to indemnify and hold Ballmason Pty Ltd (and its officers, directors, agents, subsidiaries, joint ventures, employees and third-party service providers, including but not limited to BallMason Pty Ltd.), harmless from all claims, demands, and damages (actual and consequential) of every kind and nature, known and unknown including reasonable attorneys` fees, arising out of a breach of your representations and warranties set forth above, or your violation of any law or the rights of a third party. For any content that you submit, you grant Ballmason Pty Ltd a, perpetual, irrevocable, royalty-free, transferable right and license to use, copy, modify, delete in its entirety, adapt, publish, translate, create derivative works from and/or sell and/or distribute such content and/or incorporate such content into any form, medium or technology throughout the world without compensation to you. By submitting your e-mail address in connection with your rating and review, you agree that Ballmason Pty Ltd and its third party service providers may use your e-mail address to contact you about the status of your review and other administrative purposes. Is this review helpful? 0% of people found this helpful! Sturdy bottles that do home made natural soda's beautifully! Heavy duty 500ml amber flip-top bottle: European Grolsch style with strong wire bail. Available in pack of 12. Heavy duty 500ml amber flip-top bottle: European Grolsch style with strong wire bail.Perfect for.. 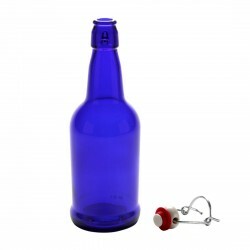 The EZ-Cap bottles come with a re-usable gasket cap assembly which snaps firmly into position by mea..
Make ginger beer the traditional way!Make delicious ginger beer from scratch using ginger, brown.. Brew it Yourself: Quick and Easy! The Two Thirsty Gardeners show that brewing your own delicious alcoholic drinks can be surprisingly .. Heavy duty 750ml amber flip-top bottle: European Grolsch style with strong wire bail.Available in ..
Ball Wide Mouth Lids with Bands for preserving fit all regular-mouth glass preserving jars. Seal in ..
Fermentation Probiotics Guide - Stefan Mager laminated chart and reference guide This chart feature..